As I write this piece, the Facebook post by someone named Ronnie Magtibay has nearly 150,000 shares. This is unacceptable and dangerous given the fact that the story is fabricated. The post was obviously an attempt to criticize Nike's decision to let go of Manny Pacquiao as an endorser because of his anti-LGBT comments. Criticism is fine just as long as you don't fabricate stories to prop up your arguments. 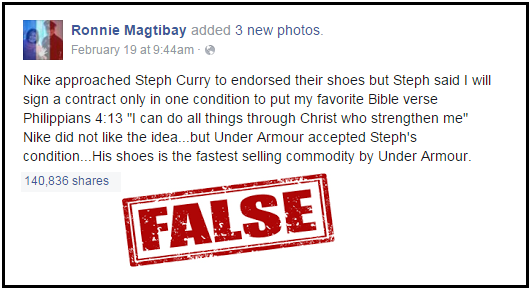 In said post, Magtibay wrote: "Nike approached Stephen Curry to endorse their shoes but Stephen said "I will sign a contract only in one condition. And that is to put on the shoes my favorite Bible verse which is Philippians 4:13 - "I can do all things through Christ who strengthens me." Nike did not like the idea. But Under Armour accepted Stephen's condition. His shoes is the fastest selling commodity by Under Armour." This is simply not true. Just a quick Google search will tell you what really happened. There's absolutely nothing that tells of a story wherein Curry said he will sign a contract with Nike only if he can put a Bible verse on his shoes. 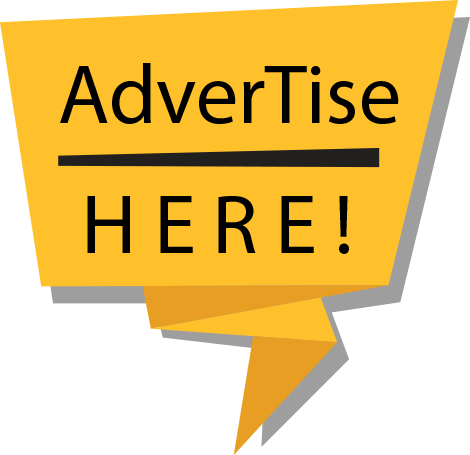 We are talking about a global brand here letting go of an endorser because of his religious beliefs. If this really happened, there'd be thousands of pages online tackling the issue. America is a secular country and issues like this get a lot of traction. Not a single story about the thing. I repeat, this story by Magtibay is not true. Curry already had an endorsement deal with Nike and in fact he had his own personalized shoes with a Bible verse on it. This was during a time before he turned into a superstar. When the endorsement contract ended, Nike offered another contract to try and keep him. Under Armour then countered the offer. Nike didn't make another offer. Remember that this happened before Curry's breakout as a superstar in the sport. So of course, Curry signed with Under Armour which was the higher bidder. In a nutshell, Nike let go of Stephen Curry because the company thought that the basketball star wouldn't be able to sell signature shoes. So it was a business decision. The company didn't let him go because they didn't want to put Bible verses of Curry's choosing on any of their shoes. They let him go because at that time they thought he isn't a very promising business investment. That all said, let's go back to Mr. Magtibay. I'm assuming that he is a religious person, a Christian. After all, in his profile, he has written "Jesus Christ is my Lord and Savior." I want to ask Mr. Magtibay a question. Isn't lying an abomination in the eyes of your Lord? According to Proverbs 19:9, "A false witness will not go unpunished, and he who breathes out lies will perish."